I know I’ve used up all the adjectives in my travel writing bag o’ tricks in explaining the beauty of Prague long ago. Let’s just say this instead: Prague is addictive. From the moment you step into Prague’s Old Town, you’re hooked. I’m living proof. I can’t stay away from Prague. For some reason or another, I’ve expectedly and unexpectedly found myself lingering in Czech Republic’s capital more than couple times since my first trip there over ten years ago. Much has changed in that time except that it still possesses a rare power to captivate. Every single time. Once you’ve chosen the best time to visit Czech Republic, the hardest part in planning out your first 24 hours in Prague is deciding what to leave out, not what to throw in. There’s a ton of things to do in Prague, and even if you’ve dedicated an entire week to the Czech capital, there’s a good chance you’ll miss something. Looking beyond Prague? Check out this 10-day Czech Republic itinerary for ideas on where to go next! That’s perfectly okay. You can’t expect to experience a city as diverse as Prague in a week, let alone on such a time-crunch. With only one day in Prague, I’d recommend focusing your itinerary on the area in and around Prague Old Town. Keep in mind: Not everyone loves the medieval core of Prague. In high tourist season, Old Town gets slammed with crowds. I’m talkin’ elbow-to-elbow, claustrophobia-inducing masses. If you can visit Prague in the off-season, all the better. If not, don’t worry: We’ll find you a little breathing room somewhere today! 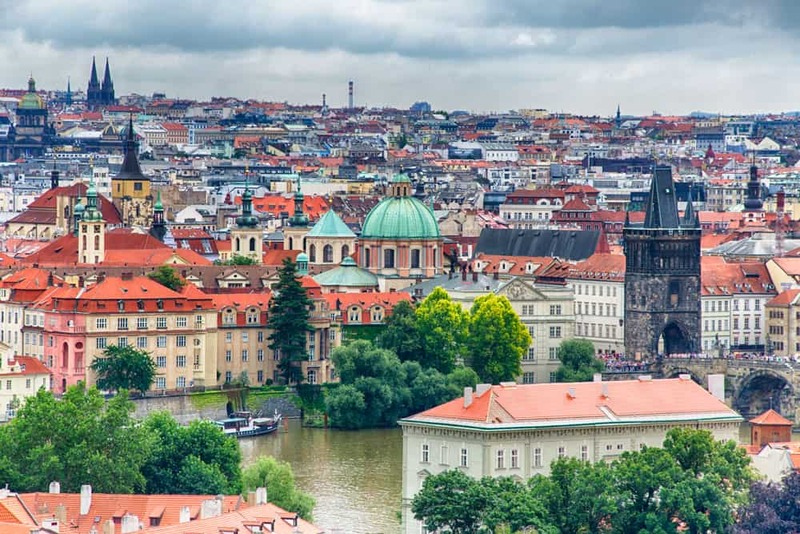 Preparing for your Prague itinerary? Don’t forget to protect yourself with travel insurance! The two most remarkable buildings on Old Town Square are the Church of Our Lady before Týn and Old Town Hall. Both are built in a architectural style that’s distinctively Czech—you won’t often find architecture like this elsewhere in Europe. Before you move on from Old Town Square, peek into Týn Church and check out Old Town Hall’s remarkable 15th-century Prague Astronomical Clock. It’s the world’s third oldest clock of its kind, and the only working one. Visit the Prague Astronomical Clock at the top of the hour to watch Death, a detailed skeleton figure, hammer the time. Finish off your time in Old Town Square with a quick trip up the Old Town Tower for epic views unto Old Town Prague. Want to dig deep into Old Town? Book yourself onto one of these recommended guided tours! Best of Prague Tour: Discover the highlights of Prague by foot, bus and riverboat 3.5-hour tour of Old Town, Lesser Town and Prague Castle. Guided Old Town & Prague Castle Tour: Immerse yourself into Prague’s history on this 3-hour walking tour of Old Town & Prague Castle! Classic City Bike Tour: See more of the city in less time with this 2.5-hour guided bike tour through Old Town, New Town, and the Jewish Quarter. From Old Town Square, it’s a 10-minute walk to Charles Bridge, Prague’s second most popular tourist hangout. Charles Bridge itself is interesting, but what will get your traveller veins pumping are the magnificent views in all directions. Many Prague postcards feature Charles Bridge as their vantage point, framing shots of Prague Castle, St. Vitus Cathedral or Old Town among its distinctive bridge towers and baroque religious statues. After draining your battery snapping shots of some of Prague’s finest views, continue walking over Charles Bridge into Malá Strana. Beatles fans should “give peace a chance,” and take a quick side-trip to the John Lennon Wall on Velkopřevorské náměstí. After crossing under the bridge tower at the end of Charles Bridge, turn left and hold left until you see a wall covered in graffiti. The John Lennon Wall has been around since the Communist era, so you’ll no doubt stumble into some interesting political messages here! 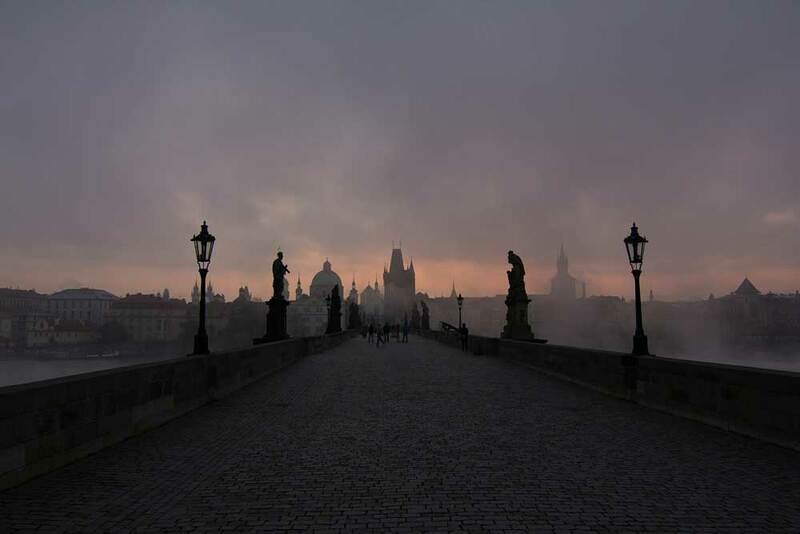 Loving the riverside views at Charles Bridge? Get more of ’em on one of these hand-picked river cruises! Vltava River Sightseeing Cruise: Spend 45 minutes gawking at Prague’s skyline and some of the city’s most iconic sites including Charles Bridge and Prague Castle on this Vltava River cruise! Lunch Cruise on the Vltava River: Enjoy a leisurely buffet lunch to the sights of Prague on this 2-hour riverboat cruise! Walking Tour & River Cruise: Combine a walking tour with a riverboat cruise on this 3.5-hour excursion. Price includes a lunch on the boat. Wind through Malá Strana, following the signs to Prague Castle. Don’t mind the uphill walk. Once you get to the top and soak up the breathtaking views over Prague, it’ll all be worth it! Prague Castle won’t conform to your ideal European castle. You won’t find towers and turrets, or be able to imagine knights wooing fair maidens among the ramparts. Prague Castle, instead, feels more like a small town in the middle of the city. Spend some time wandering through the alleyways up here to take a trip back into the Middle Ages. Keep on the lookout for Golden Lane (Zlatá ulička), a narrow medieval street in the northeastern corner of the complex that was once home to Czech writer Franz Kafka. In the Prague Castle complex, the big must-see is St. Vitus Cathedral. Step into this cavernous church, one of Prague’s most interesting Gothic sites, and you’ll see why. Founded in the 14th century, St. Vitus Cathedral is not only the largest and most important church in the Czech Republic, but had a profound influence throughout Central Europe. The Late Gothic style you’ll see here predates Stephensdom in Vienna and Church of St. Marko in Zagreb, two of Central Europe’s most impressive churches. Ready to get to low down on Prague Castle? Join in on one of these recommended tours! 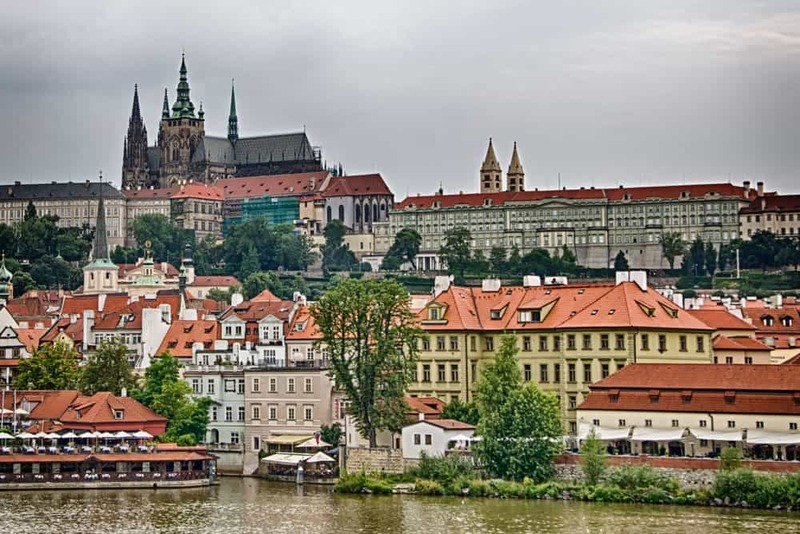 Prague Castle Tour: Explore the entire complex including St. Vitus Cathedral, St. George’s Basilica, and Golden Lane on this 2.5-hour guided excursion. Tour price includes admission to Prague Castle. After Dark Old Town & Castle Tour: See the city and castle complex at is most magical on this 3-hour after-dark tour! After exploring Prague Castle, stroll up to Chotek Gardens (Chotkovy sady), to the north of the castle complex, via the beautiful Royal Garden of Prague Castle (Královská zahrada). Designed with Italian Renaissance touches, the Royal Garden of Prague Castle has existed since the 16th-century when the Habsburgs dropped by from time-to-time to frolic. Continue east through the delightfully-tranquil Letná Park (Letenské sady) to Letná Beer Garden. Prague’s favourite beer garden, set along the banks Vlatava, offers some of the best views over the city. Order a well-deserved pint of Gambrinus or Pilsner Urquell, and relax among the greenery while soaking in the perfect city panorama before continuing to explore Prague in one day. Keen to explore Prague’s beer culture? Check out one of these top-rated food & drink tours! Half-Day Beer & Czech Tapas Tasting Tour: Learn about Prague’s beer drinking culture while sampling typical Czech “beer tapas” on this 4.5-hour tour through 4 traditional beer halls. Includes samples of 5 different beers and 4 foods. Craft Beer Tour & Tasting Experience: Sample 11 different Czech craft beers on this fun & informative tour through three local brewpubs. Czech Beer Tasting: Try 7 popular and lesser-known Czech beers at a lovely Old Town pub on this evening beer-tasting extravaganza with a local expert beer master. Cross back into Old Town via Čechův Bridge (Čechův most) towards the Prague Jewish Quarter (Josefov). Start your exploration of Josefov with a quick hats off to Prague’s most famous international author at the Franz Kafka Monument. Although not as impressive as K., the mammoth kinetic sculpture of Kafka’s head at Národní třída, the monument is just weird and wacky enough to spread a smile on your face. Confusingly most of Prague’s Jewish historical sites combine to form the Jewish Museum of Prague. 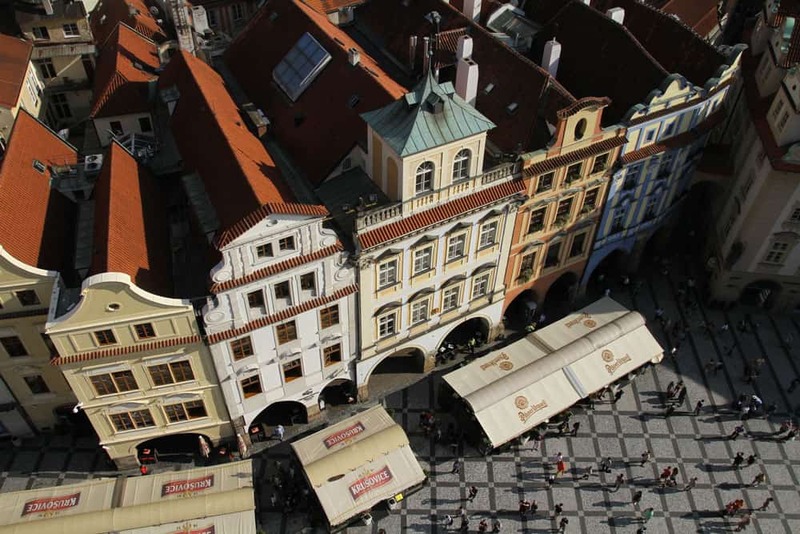 The best of way to experience the Jewish Quarter is to hop on a Prague Jewish Walking Tour that includes admission to all the sites of the Jewish Museum of Prague. On the tour, you’ll peek inside a couple of Prague’s most famous synagogues including the stunning Spanish Synagogue, built in a Moorish style more at home in Andalusia than Central Europe, and the Pinkas Synagogue, a 16th-century Gothic synagogue and Holocaust memorial. 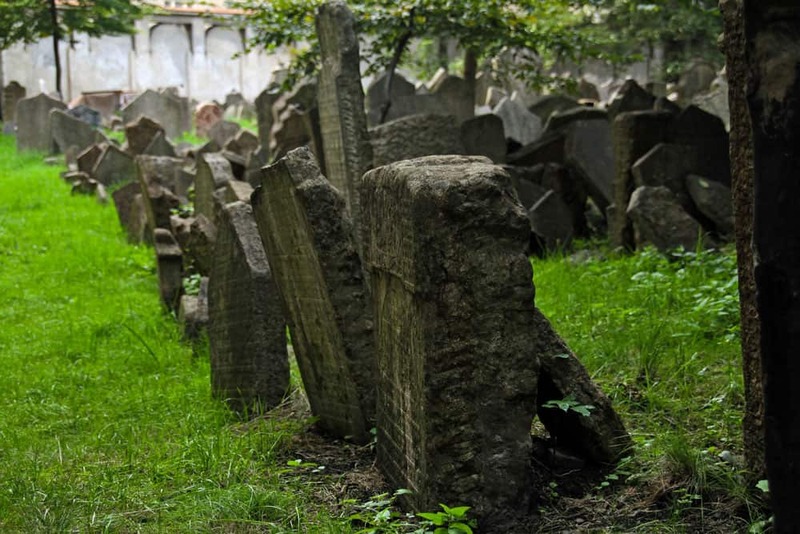 Before you leave the Jewish Quarter, stroll through the Old Jewish Cemetery. It’s easily one of the eeriest and most sombre places in Prague, echoing stories of centuries past among the crooked tombstones. Now that you’ve worked up a hearty appetite, pop into the Restaurant Mlejnice, just south of the Old Jewish Cemetery on Žatecká. Enjoy some traditional Czech grub (might I suggest their beer goulash—it’s one of the best in Prague! ), and wash it all down with a well-earned cold draught Czech beer. 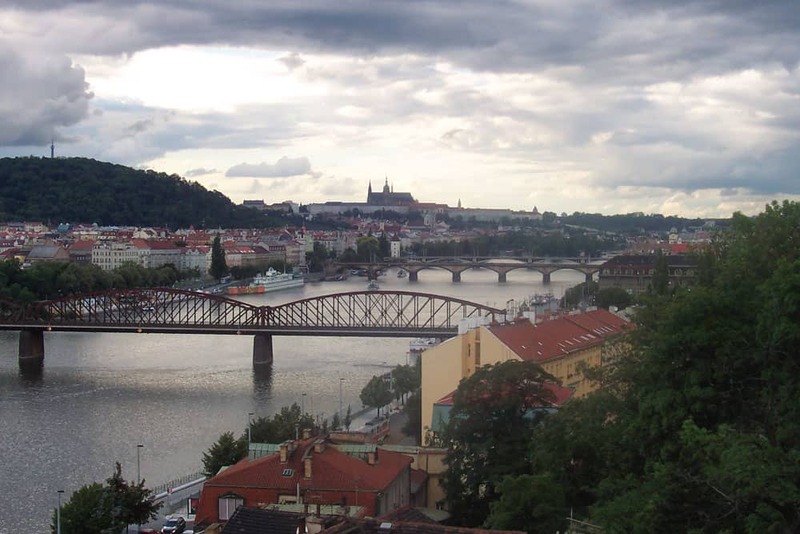 Interested in Prague’s Jewish history? Don’t miss out on these recommended tours! Jewish Quarter Walking Tour: Explore Prague’s Jewish Quarter in depth on this 2.5-hour walking tour! Price includes admission to all the sites of the Jewish Museum. Jewish Quarter Tour: Check out all of the major sites of the Jewish Quarter on this educational 3-hour guided excursion! Tour includes admission to the Pinkas Synagogue, Klausen Synagogue, Maisel Synagogue, and the Spanish Synagogue. Jewish Quarter Walking Tour: Experience the best of Josefov on this 2.5-hour tour! Includes visits tothe Pinkas Synagogue (Holocaust Memorial), Old Jewish Cemetery, Klausen Synagogue, the Old-New Synagogue, and the Spanish Synagogue. Tour also provides a 10% discount on admission to the Jewish Museum. From Josefov, slip down to the Staroměstská metro station to head towards Vyšehrad. This 10th-century fortress is oft-forgotten by tourists simply because of the distance from Old Town. Especially for the views along the Vltava River in both directions, the trip down to Vyšehrad is worth the short metro ride. Unlike the small medieval town feel of Prague Castle, Vyšehrad is more of a leafy park with architectural masterpieces hidden in the midst. Nothing stands out more here than the Basilica of St. Peter and Paul at Vyšehrad, an 11th-century church that swaps out its architectural stylings every 3-4 centuries. The results of the latest remodelling built up a neo-Gothic façade that fits in perfectly with the Czech cathedral cadre. Wander throughout Vyšehrad, absorbing the views along the way, in search of its architectural gems. Scope out the over 900 years-young Rotunda of St. Martin, and the Vyšehrad Cemetery where some of the Czech Republic’s most famous names, including composer Antonín Dvořák, are buried. Interested in getting off-the-beaten-path in Prague? Book yourself onto one of these recommended tours! Hidden Gems Walking Tour: Move beyond the Old Town bubble on this 3-hour walking tour including a visit to Vysehrad. Mystical Vysehrad Walking Tour: Explore the leafy spaces & historical sites of Vysehard with the help of a professional guide on this relaxing 2.5-hour walking tour. Hidden Prague Bike Tour: Soak in some of Prague’s finest views on this 3-hour cycling tour to some of the city’s lesser-known corners ending in Vysehrad. After exploring Vyšehrad, make your way back towards Old Town via Wenceslas Square (Václavské náměstí). The point of visiting Wenceslas Square isn’t simply to revel in beauty. Truthfully, other than the National Museum, it looks like any other Central Europe main boulevard. 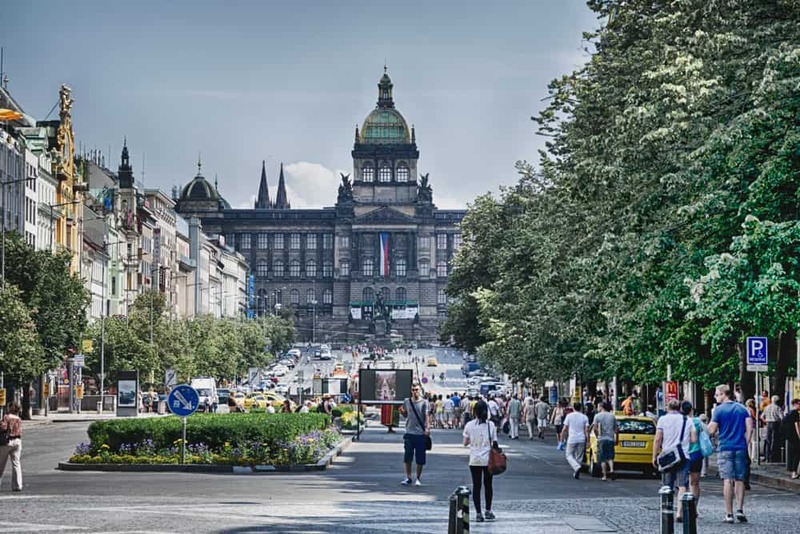 The magic in visiting Wenceslas Square is in reliving the events and the stories that have made the square the most famous public space in modern Czech history. It’s seems as if every major event in Prague’s history traces back here. When Czechoslovakia declared independence from the Austro-Hungarian Empire in 1918, it was proclaimed here. The Prague Uprising that drove the Nazis from German-occupied Czechoslovakia, and even the famous self-immolation of Jan Palach, a Czech student protesting the Soviet invasion during the Prague Spring, boiled over right here in Wenceslas Square. Want to feel Czech history in action? Hop on a Small-Group Prague Walking Tour to bring it all to life! If you’re interested in modern European history, I’d recommend two museums on and around Wenceslas Square: Museum of Communism and Cold War Museum. Perhaps it’s just my weird fascination with the Soviet Union kicking in; still, give one (or both) a glance if vintage war relics, propaganda art, and spy equipment gets your mojo goin’. Interested in Prague’s communist history? Then you’ll love one of these communist-themed tours! Communist & Nuclear Bunker Tour: Learn about daily life under communist rule in Czechoslovakia on this 2-hour theme tour! Stops at the Nuclear Bunker Museum, a real-life bunker from the 1950s hidden underneath the city. World War II & Communist History Tour: Explore Prague’s tumultuous 20th-century on this ultra-educational walking tour! Back to Communism Walking Tour: Relive the Cold War era on this walking tour with a professional guide who lived through the socialist era in Czechoslovakia. Visits include the former secret communist police headquarters, former spot of the Stalin statue, and other historical places where Prague’s revolutions and rebellions took shape. There’s a certain challenge in choosing where to stay in Prague. No longer is Prague a forgotten corner of Europe, but one of its hottest destinations. Last minute planning won’t get you very far in this city—you’ll need to plan ahead by several months if you want a good room at a good price! Hotel Lippert: Literally half a block from Old Town Square, getting closer to the action doesn’t get easier than this. The hotel offers large, clean rooms in a city with ever rising accommodation costs. MyHouse Apartments: Excellent alternative to a traditional hotel. These apartments, located in Josefov next to the synagogues of the Jewish Museum of Prague, offer better value than most hotels in Old Town. The quiet neighbourhood ensures a restful stay. Salvator Boutique Hotel: A stylish 4-star boutique hotel located within steps of Wenceslas Square and the Prague National Museum. Rooms here are quiet, spacious and spotless with garden and city views. Savic Hotel: Located in the heart of Old Town in an old Renaissance and Gothic building, this hotel oozes classic Old World charm. On-site restaurant serves up tasty local fare. Love culture? Get into the head of Prague’s most famous literary mastermind at the Franz Kafka Museum near Charles Bridge. Or, when it opens again in 2017, spend hours filtering through the enormous National Museum on Wenceslas Square. Can’t get enough of Prague from above? Trek or ride the funicular railway up Petrin Hill to the Petrin Observation Tower before visiting Prague Castle. Almost 300 steps will get you atop the tower for some the city’s best sweeping views. Need more liquid calories? Pop into the Prague Beer Museum (not really a museum, but a gastropub) on Dlouhá to glug down one of the 30, mostly Czech, draught beers.